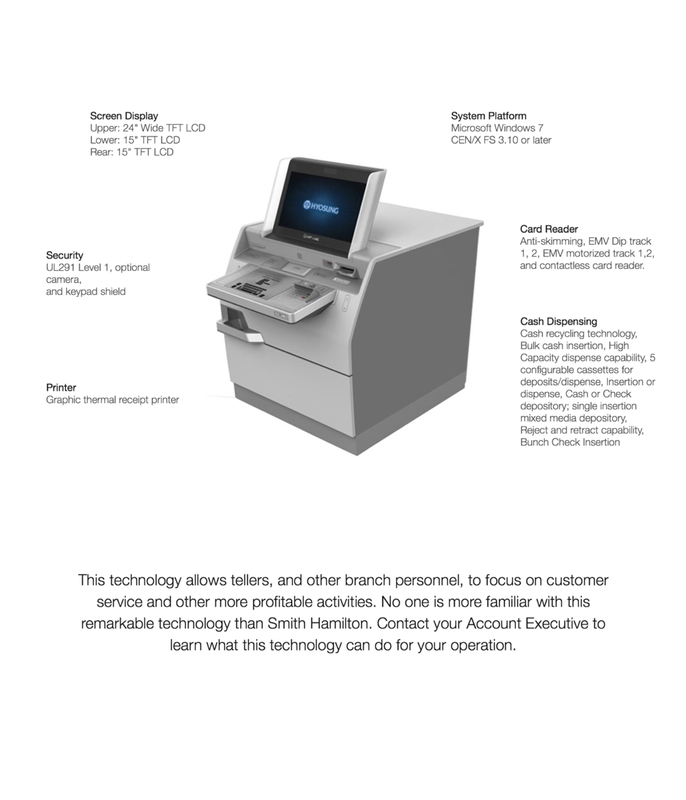 MX8800 manages routine self-service transactions seamlessly and supports employee-assisted transactions— either in person or via video link— when needed. The result? The ability for your branch to handle more trans- actions with existing resources. MX8800's advanced security features protect bank and customer data, increasing your team's ability to develop long-term, client trusted relationships. The rebirth of the branch. More customer touch points for both sales and service. Greater efficiency and lower costs. Superior consumer service and access. the explosion of alternate channels. Many banks have already closed, or plan to close, at least some of their branches. Branch networks are costly to operate and, increasingly, customers choose to purchase financial products through digital channels. But reducing or streamlining their branch presence, or moving to the extreme and adopting a wide scale branchless model, may not be in a bank’s, or its customers’, best interests. Customers value branch interaction—78 percent of US-based consumers said they expect to visit their local bank branch just as much or more frequently in the next five years.1 As a result, banks must reposition their traditional branch model. By taking advantage of digital innovation, banks can transform the branch network to offer banking services that are more personal, immersive, and relevant for their role as an everyday bank. • Undertake detailed research online to compare services. • Visit the branch to validate their online findings and sign up to products or services. • Tend to have more products and be more profitable over the customer life cycle. There are many reasons why closing a bank’s branches can result in poor outcomes; the loss of high street presence can shrink a bank’s presence in the public; competitors are in a stronger position to seize market share; brand equity can be compromised, and customers could lose confidence and seek out another bank. Millennials are a good example of a strong behavioral response to a bank’s branch strategy. Younger customers, particularly those aged 18 to 24, make the greatest use of branches and in-branch value-added activities (Figure 1), with around one-half of them engaging in at least one value-added service during their last visit.3 While customers in this segment are most vocal in wanting exceptional online and mobile banking, they do not view digital as a complete substitution for branches. Research shows that this age group has a noticeably greater bias towards physical interaction, all pointing to their need for face-to-face contact, advice and reassurance in the initial stages of their own financial journey. Three key roles - Vital if branches are to attract and retain future customers: digital ambassador, advisor hub for specialized services and problem solver. Most consumers now use some form of digital banking. Research shows that 80 percent of the digital generation, or “Gen D,” are embracing digital for daily banking needs, but only 22 percent act completely self-directed.4 Baby boomers, the majority of Gen D, regularly use social media, yet digital advisor access and tools are of relatively low value to them. Branches can help increase the digital penetration of a bank’s customer base and lower bank transaction costs by educating digital laggards. Branch employees can offer advice on using digital tools for everyday banking needs and invest in in-branch digital capabilities. More than one-half of consumers rank interactive screens as the most important in-branch technology (Figure 2). • Center full sales and service support around customer preferences and needs. • Provide the “human touch” through specialist staff that are on-hand to advise on different or complex services. • Offer extended hours—weekends, late nights or on-demand remote services via video conferencing. • Initiate conversations, setting up and closing business in the branch, then maintaining the dialogue online. • Enable value aggregation with other providers in the everyday bank ecosystem. First-contact resolution is key to retention. Of the consumers who switched to another provider due to poor service, more than 80 percent said they could have been retained, mainly if their issue had been resolved on their first contact with the bank.5 While bank customers very frequently use online banking for prospection and access to services, 65 percent of them use the branch to fix problems. Modern branches need to convert issue resolution to a competitive advantage, particularly for payments errors, new portfolio scenario modelling in the bank’s app and other content-driven problems. To do so, branches must integrate seamlessly with digital channels. For example, a customer who is uncomfortable using an online calculator to self-advise a mortgage decision might use it to first assess what he or she can afford, then follow up with a visit to the branch. Providing faster, better first-contact resolutions requires continuous training of branch staff and equipping them to excel in solving customer problems—such as specialist advice around mortgages and pensions. Using analytics-driven customer insights to make better decisions and match branch elements (for example, sites, types, in-branch features and so on) to local target preferences, particularly millennials. Equipping branches with the right soft skills and technology capabilities to engage customers, solve their problems quickly, offer advice and sell more products and services. Assess customer engagement using survey results, increase digital connections via branches, such as clicks and apps, and monitor metrics ongoing. By streamlining and modernizing branches to offer better service, reduce costs and improve the customer experience, banks can fully exploit the competitive advantages of a digital world and become an everyday bank that makes the best use of its strategic assets.